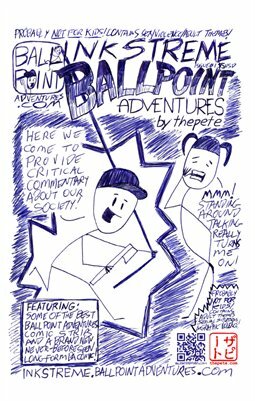 BALLPOINT ADVENTURES from 4/19/99: Billy Demands Answers (with an AX) from George! Click here to see the full-size fictional honesty--I MEAN--web comic! Click here to see the full-size denial--I MEAN--web comic strip. Click here to see the full-sized web comic strip. BALLPOINT ADVENTURES for 7/20/15: Barbie Wants to Kiss Obama! Click here to view the full-size web comic strip. BALLPOINT ADVENTURES for 7/13/15: Introducing Bart the Ballpoint 'Bot! Here to take Billy's job! Click here to see the full-size redundantification (the full-size comic strip)! So much to say about this! Click here to see the full-size web comic. BALLPOINT ADVENTURES for 7/6/15: Billy Learns a BIG Lesson About Money in this week's #BallpointAdventures #webcomic! Click here to see the full-size fictional violence (comic strip).